Q: What is the phone number for Animal Poison Control? A: We accept cash, personal check, Visa, MasterCard, Discover, American Express, Wells Fargo and CareCredit. Full payment is due when service is rendered. A: Pet insurance companies generally will supply you with claim forms you bring to your veterinary office for the veterinary staff to complete. You pay the veterinary office directly, mail or fax the claim form to the insurance company, and they will reimburse you the amount allocated by your plan. There are various pet insurance companies, so be sure to research which plan best fits your family's budget and your pet's health needs. NorthStar VETS does not endorse one plan over another but, for your convenience, we've listed various pet insurance websites on our resource page. Q: Will I be told how much treatment will cost before it's provided? A: Absolutely. During your consultation with the specialist or emergency clinician, we'll prepare an estimate based on the recommended treatment and review it with you in advance of any treatment being provided. Q: Can NorthStar VETS be my regular/family veterinarian? A: Unfortunately, no. While we're flattered that you may want us to take care of your pet's routine medical needs, we only treat patients requiring specialty and/or emergency care. We don't do routine procedures such as spay/neuter, dental, vaccinations or heartworm/flea prevention unless previously arranged with your family veterinarian. There is one exception, however: if you're seeking primary care for exotics and avian (birds), including wellness visits with consultations regarding husbandry and management, our Avian and Exotics Department is happy to provide this service. 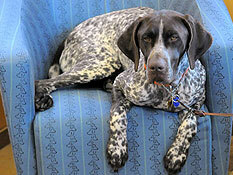 Q: Do I need a referral from my regular veterinarian for my pet to be seen at NorthStar VETS? A: To schedule an appointment with a specialist, yes - a referral is needed. If you come through the emergency department, a referral is not necessary. If you are seeking primary care for exotics and avian (birds), including wellness visits with consultations regarding husbandry and management, a referral is not necessary, and our Avian and Exotics Department is here to serve this need. Q: What's the difference between a board-certified specialist and a family or primary care veterinarian? A: A board-certified specialist has completed rigorous training comprising four years of undergraduate school, four years of veterinary school, a one-year internship, and a two- to three-year residency in a chosen specialty. Then, the doctor must publish original research and sit for a national exam, known as 'boards.' Upon successfully passing the exam, the specialist receives the highly distinguished Diplomate status, signifying their expertise in a chosen specialty. Q: What does it mean if my family veterinarian has ABVP (American Board of Veterinary Practitioners) after his/her name? A: This means your veterinarian has become certified in, and focuses on, a specific group of animals such as dogs, cats, horses or birds. Please note that someone with ABVP after the name is still considered a primary care veterinarian (not a specialist). Q: Can I visit my pet when he or she is hospitalized? A: Yes, and we encourage you to do so. Our visiting hours are Monday - Friday, 7:00 a.m. - 11:00 p.m., and Saturday and Sunday, 2:00 - 11:00 p.m. Please call ahead to schedule your visit with your pet. 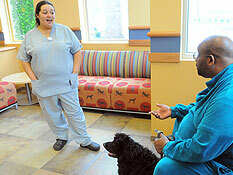 Q: Can I call to get updates on my pet's condition when he or she is in the hospital? A: Absolutely! Our team is here to help ease any anxiety about leaving your pet for treatment. A receptionist, technician, ER clinician or the attending specialist can provide you with an update any time between 9:30 a.m. and 12 midnight.